Animal Behavior Consulting is an Atlanta-based animal training and behavior service, offering exceptional consulting services backed by more than a decade in the industry, Leigh Sansone, Esq., CPDT-KSA, PMCT, is owner and lead trainer. We offer multi-species animal training services, specializing in dog training and behavior. Leigh’s sister company, New York City-based Ruff Customers received multiple “Best of New York” honors and was voted as the Top 5 dog training and behavior service company in NYC for 2017. In March of 2018, Leigh moved from NYC to ATL and has expanded her training and behavior services to include multi-species experience with other animals in need. At this time, ABC is accepting applications for services only on an extremely limited basis. 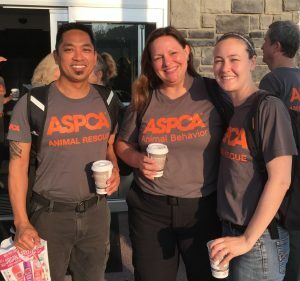 Leigh is currently deploying with the ASPCA as a professional behavior responder with the Anti-Cruelty Group. See here for more information and to donate to a worthy cause. If you have questions or would like a referral, please feel free to contact us via the following form, and we will get back to you shortly. THANK YOU FOR YOUR INTEREST!